Have you been bitten by the pinterest bug? I certainly have, and am the proud curator of 29 boards filled with 687 cool, pretty, clever, crafty, tasty things I'd love to try. However, I mostly just stick stuff on my pin boards and feel smug that I have such impeccable taste in things I'd theoretically be interested in, and then never actually do anything with them. I certainly think I've tried no more than 10-15 of the things I've pinned. Well, a couple of weeks ago I really needed to do something about the bath mats in our bathrooms (glamorous!) because they were getting pretty undesirable, and I knew that throwing them in the washing machine would only go so far. In a lightbulb moment of sheer brilliance I suddenly remembered that I had seen someone on Pinterest recommend adding equal parts of white vinegar and baking soda to your regular laundry detergent to de-funkify towels. So I tried, and it worked wonders. It has been a couple of weeks now, and I still gaze in wonder at my white fluffy mats. Pinterest to the rescue! Do you see where this is going? Yes, I thought it might be fun to try to actually try out some of these things and then blog about them. In fact, I'll even lend myself out as your very own Pinterest guinea pig if you tell me what pins you've been dying to try. As my first effort, I give you this twisty ponytail that I found pinned here, from this blog, Everything Fabulous. Pretty... not too tricky-looking, let's give it a try. Anyone who sees my head on a regular basis knows that I'm a pretty low-maintenance kind of girl. If it takes more than three minutes, I'm just not interested. Most days you'll find me makeup-less with my hair in a ponytail, realizing that I've left my wedding rings at home. But even a schlub like me likes to feel pretty, so why not give it a try? Friends, this was more like a one minute style. And it only required one hair tie and worked just fine on wet hair. Photographing the back of one's own head: not easy. There were a few things in the description that weren't entirely clear, and I can see now that mine came out a little different from the photo. I think part of that comes from the model not having quite as thick hair as mine, and her ponytail started out a little lower and looser than mine. 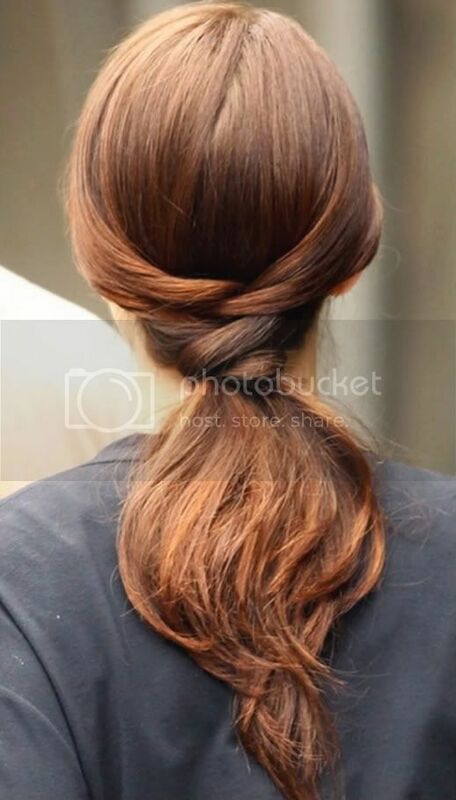 Also, next time I think I'd try to make the two sections of hair a bit less even, so you have more hair in the pony tail you loop through, rather than in the section you wrap around below. The description in the Pinterest text was a lot more clear to me than the blog itself, so I'd recommend using that if you're planning to try it yourself. 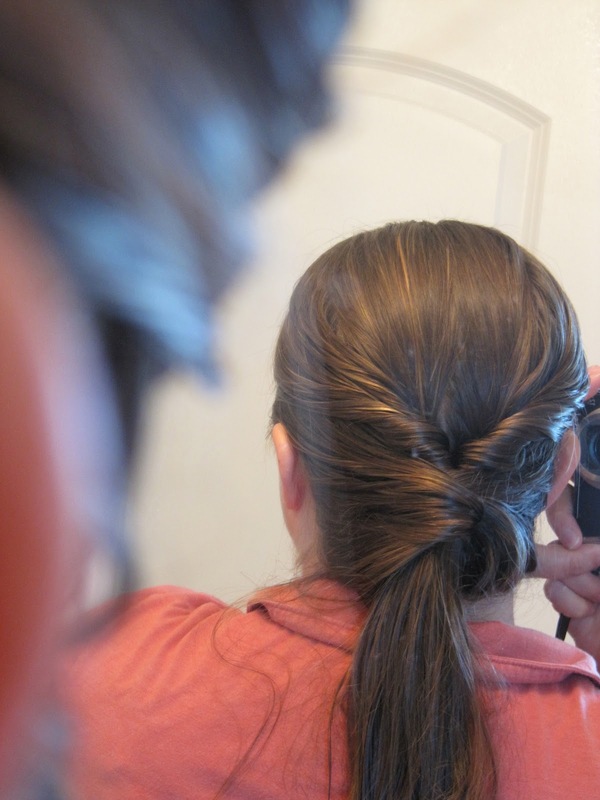 All in all, though, it's a quick and easy way to do a pretty take on the humble ponytail, and one I'll definitely be revisiting. For a first attempt I'm really pleased with how it turned out, and will be trying it out again soon. Lovely! I definitely will be trying this one out. Thanks for showing it in "real life!" BTW, I love your site.